Aha! Found some. In a councillor’s garden. 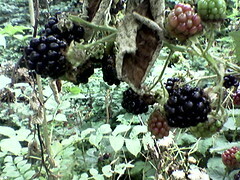 Enough to fill a punnet, but not enough to jam, so I’ll be freezing them and coming back to them later. Hmm. Interesting formatting, thanks Flickr. ← Anyone out there like cricket?